One of the top selling cheer shoes for youth leagues and competitive school teams is the Converse Kick Twist. It is also projected to be a top shoe for 2012. 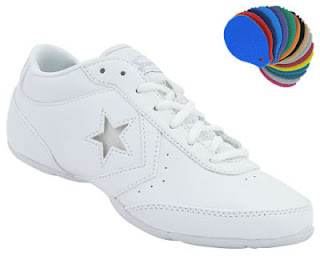 The Converse Kick Twist cheerleading shoe is versatile enough to be worn indoors and still provide the durability and support for wear outdoors. The low-profile, sleek looking design and color changing star logo on the side of the shoe is appealing to squads of all ages. In addition, this particular shoe is budget friendly to help keep costs down for your organization. The fit of the Converse Kick Twist cheer shoe is much different than regular street shoe sizes. The Converse Kick Twist typically fits small and narrow. In kids sizes, we usually recommend going up 1 to 1½ sizes from regular street shoe size. In women’s, we usually recommend going up ½ to 1 full size depending on the width of your foot and how you want the shoe to fit. Of course, these are just recommendations and we do not guarantee a fit.